Rosary College, Crumlin » P.E. The aim of the Physical Education Programme is to contribute to the overall development of the student through a comprehensive programme of selected physical activities and related cognitive and social experiences. Physical Education is for all students and active participation is strongly encouraged. Our extensive P.E. 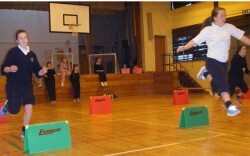 programme is aimed at promoting the enjoyment of sport as well as training for future health and recreational activity.